This week seemed a little shorter with no Tuesday session but it was good to get back to creative writing after a longish break. I had a reminder of how many links we have from Space2Create out to some other amazing organisations and services. I met Philippa from Pioneer Projects and we had a great discussion about plans for the future where both organisations can collaborate for their mutual benefit and that of their services users. We look forward to some amazing work to be done in the coming six months or so. It was a good session. We started with a game going round the table adding exaggerated statements. Then we wrote a short piece from a starter sentence. We wrote a rhythmic poem from given words and finally a speech on our beliefs (both real and imagined). A lot of different activities and styles of writing we all enjoyed. On the ward we looked at butterflies and moths. We had beautiful books for reference, and by using different media, papers and techniques, we tried to recreate the delicate and intricate patterns on their wings. One technique we used,… which was very successful, was to fold a piece of paper in half, drop watery paint onto one side of the fold, and then close the paper so the image also transferred to the other side of the fold. This proved to be very effective; so much so that one participant went on to experiment using just half an image on one side of folded paper. The session was quite experimental, with some really successful outcomes. In DeafArt the group took up the theme of zentangles creating some interesting patterns as well as some great pictures. In the session, we followed on with the theme of butterflies that we had used when on the Kentmere Ward yesterday. The image of the butterfly is very evocative; delicate, and yet it has great appeal because it develops and grows and bec…omes something wonderful. We used fine pens to recreate the very intricate patterns on the wings. Others in the group worked on individual pieces, as can be seen in the images. As always, the Thursday session was individual and immensely creative. In WellArt the group worked to try and finish our giant zentangle. We were nearly done at the end, just a few small bits to fill in which we will do next week. Mike was painting his heraldry, Debbie finished off her Mondrial tribute, Dana was painting an eye and Julie helped Kate decorate her nails. Week 25: Zentangle mania and felting fun! It seems that ideas for creating can sometimes take on a life of their own. We had two examples this week. Zentangles are complex black and white patterns that focus the mind and, in a way, cause you to be in the present. Creating one is an almost medative process and very relaxing as well as satisfying. We introduced them to the 2Create group on Tuesday, they were done on the ward on Wednesday and by the DeafArt group on Thursday. WellArt went one step further and produced a huge one! Then of course the Thursday Group were too busy felting. The group has been felting for weeks and shows no sign of stopping! They are creating increasingly elaborate pieces and enjoying themselves as well. Having looked at Zentangles in a few sessions this week we decided the WellArt group would go that little bit further. We are creating what must be the largest Zentangle in Kendal if not Cumbria!. We used a combination of black acrylic paint… and pens to create random patterns. The session was very relaxing and it was great to have an activity you could easily chat along to as you worked. There are some gaps to fill n but it should soon be done. All we need now is somewhere big enough to put it up. See the full work in progress in the video above. In Thursday’s session, we all worked on our own unique pieces. One participant wanted to create a small bag to hold scrabble pieces, and was keen to learn to use the sewing machine. By the end of the session she had made one, complete with …drawstring and decorative buttons, and she then went on to make another!! Two other participants carried on producing their wonderful needle felt pictures. They enjoyed it so much that they took their work home to carry on with it there. Another participant worked on her intricate needle work and another on his comic. We also tried printing using our small press. As you can see, a varied and productive session! DeafArt also had the Zentangle fever on Thursday! Session led by Ant with Greer. Another mixed bag of creative work today. Some people were still putting finishing touches to their abstract canvas pictures. Some of us explored zentangles, black and white patterns that are very relaxing and promote being in the moment. Ant continued with his tributes to the late Rik Mayall with a Young Ones picture. The atmosphere was really good and everybody was very positive as they left the session. On the ward today, we decided to use a simple palette of black and white, creating patterns and images and building up the design to fill the page. This technique is simple yet very effective, and is eye catching. It enabled participants to… create and chat at the same time, and using free forms was simultaneously relaxing yet stimulating. The group chatted and shared ideas whilst drawing. The images show some of the great work created this session. Week 24: Busy, positive creative groups and some great artwork. All the groups seemed very bust this week. In fact at times it is starting to feel cramped. Hopefully we will be in our new studios soon at the Factory in Kendal where we can spread out and be even more creative! As I looked around and listened to the conversation at the groups I was at during the week I was struck by one consistent and recurring impression. That although all the people in the room were struggling with life, with illness, severe and debilitating problems; they were all sat chatting, smiling, helping each other and themselves raise their mood and give themselves a boost. They were achieving something. From just being there and getting out to being with a group of people. It is hard to realise just how difficult it can be to face the world when your problems seem so vast and overwhelming. 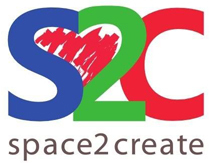 This is what Space2Create does. It puts the smile on peoples faces, it gives a sense of achievement, it makes you feel wanted and not alone, it gives a respite from the issues that loom large, it gives people hope they can move forward and it allows people to leave feeling much better than when they arrived. Running gives me the biggest boost I have ever had from doing anything. Also this week we decided, after a six week trial, to make DeafArt part of the regular service we offer at Space2Create. Ant and Greer have done a brilliant job in getting it started. The 2Create group worked towards finishing their abstract canvas. It has been an enjoyable project with many of the group noting how much better it is painting on canvas than paper. A range of styles were in evidence from the Pollock-influenced splatting to the more stylised representations of form. Ant did his own tribute to the late Rik Mayall. On the ward we decided to do printing using polystyrene tiles. An image is drawn onto the tile, and then drawn over again and again to leave a strong indentation. Water-based ink is then spread onto a flat surface, and the tile is pr…essed onto the ink, image down. The inked tile is then lifted off and placed onto a card, and again pressed down to now print the image. We chose this style of printing for various reasons: it is simple to do; produces very pleasing effects, and can be reproduced at home. As one participant stated, they felt that they had learnt something new during the session, and would try it again when they got home. As can be seen from the images, it was a very successful session. In the DeafArt group Ant showed how to use masking tape to mask out areas before painting to produce interesting shapes and images. It also gives you a nice clean sharp edge. The Thursday session was busy and very creative as always. One of our new participants wanted to try something she had never done before and liked the look of needle felting. This was a wonderful opportunity for one of our other participant…s, who was experienced in this technique, to explain the process to her and another participant. They both produced some beautiful work, and one participant stated that she was going to carry on with this technique at home. It was also a great experience for a member of the group to teach another participant, and she stated that she had really enjoyed that opportunity to pass on her knowledge. As always, there was lots of individual work being produced today. As the photos show, participants worked on needle felting, sewing, drawing, sketching and rag rugging. It was also wonderful to have a participant who had gone on to take a course at art college join us for the morning, and share her great news of winning an award for her work! A great session. A mix of things today. Some people finished off the Mondrian images from last week Others worked on a heraldry project. Most were planning for the Comic Art Festival designing character, building stories and steampunking Kendal. Week 23 An intersting week. The group got down to their canvas creations. The plan was to do an abstract painting on canvas and most have been doing preparatory work to develop their ideas. It is interesting that the group members normally can do a painting on paper in a session but the canvas pictures are taking longer! There are a wide variety of ideas and styles. A busy session on the Ward with Sue and Jo helping patients make clay models and pots. It was a very busy session with everyone working on individual pieces. It’s lovely to be able to see wonderful pieces of art being created that are obviously meaningful and important to that individual. As the photos show we had people work…ing on needle felting, needle work, printing, coil pots, comic art, book making and drawing! As a group we also discussed a plan to have a stall at the Staveley Carnival. People left today’s session with lots of forward plans for future sessions. On Thursday evening representatives of Space2Create attended the Kendal Town Council Mayor Making meeting. Lots of people there. It was good to chat and meet some new people. It was also good to meet the Deputy Mayor Chris Hogg who is an old friend of ours from work at HoleHird. We have a good relationship with the Town Council and hope this will continue into the coming year. The DeafArt group had a go at marbelling this week and produced some nice results. In this session we looked at the work of Mondrian. We looked at how we might recreate the style and used masking tape to create the straight lines, painted with black acrylic then removed the tape. We added primary colours. Some people looked at other works by \Mondrian and played with ideas inspired by the artist.